The ECBC is urging the EU Council presidency to push on with Trilogue negotiations for the covered bond package, fearing that a delay until the New Year could jeopardise its completion. Meanwhile, ECON Rapporteur Bernd Lucke, EBA and others shared their views on the state of play. The Council agreed its positon last Tuesday, the same day the European Parliament plenary approved the ECON committee report that was voted on a week earlier (20 November), meaning that Trilogue negotiations also involving the Commission could proceed. However, the Austrian presidency of the Council is said to be considering waiting until the New Year for the process to start, when the presidency will have rotated over to Romania. This has raised concerns that the package might not be finalised by mid-February, which is considered necessary if Parliament is to approve it in April before being dissolved for elections. “In light of the very narrow legislative window, the industry would be in favour of starting the Trilogue negotiations as soon as possible,” Luca Bertalot, EMF-ECBC secretary general, told The CBR. The publication of the Parliament and Council versions of the two texts have done much to alleviate fears around controversial proposals that had been discussed, while the positions of the various parties are now deemed not very far apart. Speaking on a panel at an AFME/vdp conference in Berlin on Thursday, Bernd Lucke (pictured), the MEP who led the Parliament’s initiative, agreed with this and said he does not expect much controversy in the forthcoming discussions. While German speakers and the audience in Berlin generally appreciated the Rapporteur’s work on the package, The CBR’s Neil Day, moderating the panel, put it to Lucke that representatives of the Danish, Italian or Luxembourg markets might not be so supportive of the positions he pushed. He said that defining asset eligibility criteria to maintain such standards was a challenge in Article 6, noting it caused conflict within the committee and that the guidance Parliament has given is “somewhat contradictory”. Lucke said the majority came out in favour of not simply accepting everything and a position that should not overstretch those that are required to adjust. 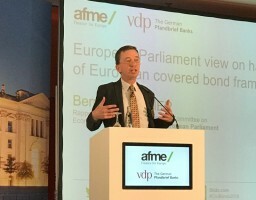 Jens Tolckmitt, chief executive of the Association of German Pfandbrief Banks (vdp), said he is happy with the outcome of Parliament’s and Council’s work. Article 6 is also one of several articles that market participants say not only needs deciding on from a theoretical point of view, but also tightening up to ensure that the wording of the final text is clear and does not give rise to misunderstanding, with the Council’s version generally considered superior in this respect. The European Banking Authority (EBA) could receive mandates for setting technical standards or producing reports in the final package, having done much to get the ball rolling on harmonisation with previous reports and recommendations. Christian Moor, principal policy officer at EBA, said that the current state of play looks “very decent”. Moor nevertheless cited four areas in which the proposals fall short of EBA recommendations. He said that while public supervision has been clarified, the Directive should be tighter on cover pool monitor requirements. Timo Boehm, senior vice president, portfolio management, at Pimco, also picked up on this point, despite welcoming the overall thrust of the harmonisation initiative. “We do appreciate a strict quarterly transparency requirement,” he said. “From what we hear so far, the Council will not follow this requirement and suggests lower-standard semi-annual transparency. However, as a minimum standard the well-established harmonised ECBC label template could work. For high concentration pools or used derivatives a line by line list of cover assets should be available. Moor went on to say that EBA’s overcollateralisation (OC) recommendation had not been followed, also noting that the Basel Committee has set a 10% level as necessary for preferential treatment. Finally, Moor highlighted that ship-loan backed covered bonds could still achieve preferential treatment under the Regulation, while EBA had asked for an impact assessment, after earlier rejecting preferential treatment for aircraft-loan backed covered bonds. Lucke also expressed confusion about support for the status of ships, saying that a proposal he had made to restrict their eligibility had been “shipwrecked”.